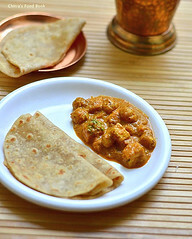 Indian Mushroom gravy / Kalan kuzhambu for rice and chapathi was in my try list for long time. Recently my neighbor shared this all rounder button mushroom gravy recipe with me. 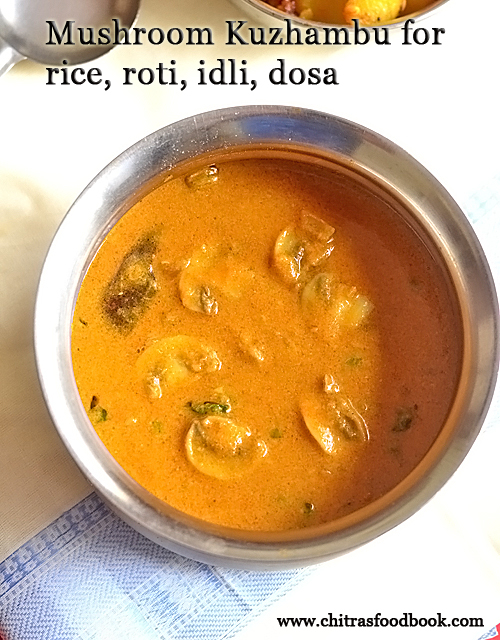 She told this mushroom masala kuzhambu goes well with rice, roti, idli and dosa too. I was so excited and tried it immediately. It came out so good and truly flavorful. I must call this gravy as mushroom kurma kuzhambu. The taste and flavor of this gravy is awesome. You will love it for sure. My house was completely filled with the aroma of this kuzhambu which made us eat more. Even though I buy mushroom rarely, I try to make some different and interesting Indian style mushroom recipes. Glad I tried this yummy mushroom kulambu recipe. This recipe is sure a keeper. I will make it very often. If you like, you can add boiled potato cubes along with mushroom. 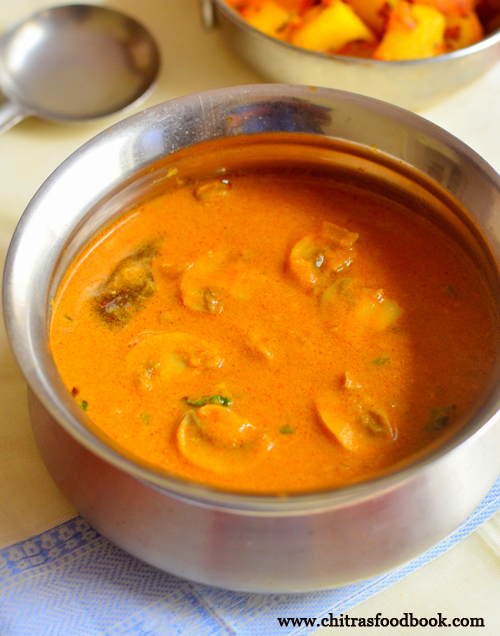 Ok, lets see how to make this easy, flavorful mushroom kuzhambu recipe with step by step pictures. 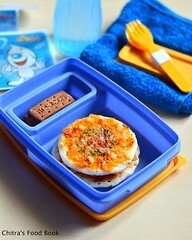 Do check out my other mushroom recipes. Mushroom / Kalan - 15 nos. Cashew nuts – 4 no. Wash and clean mushroom. 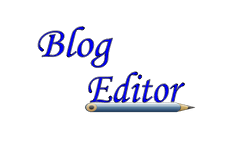 Chop and set aside. Heat oil in a kadai. Saute fennel seeds, onion, tomato till mushy. Add cashew nuts and mix well. Let it cool. 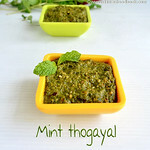 Add coconut and coriander leaves,grind to a smooth paste. Heat oil in the same kadai. Saute whole garam masala. Saute onion till transparent. Add ginger,garlic paste and saute till raw smell goes off. Now add the chopped mushroom, red chilli powder, sambar powder and salt. Mix well. Add the ground tomato paste and required water. Boil till oil floats on top. Switch off the flame. Garnish with coriander leaves. 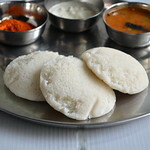 Serve hot with plain rice, idli, dosa and chapathi. Wash and clean the mushroom. Pat it dry. Chop into thick slices. Wash and chop onion, tomato and keep aside. In a kadai, heat oil. Saute fennel seeds, onion till transparent. Add tomato and saute till mushy. Lastly add cashews and mix well. Switch off the flame and cool down. Add coconut, coriander leaves. Grind to a smooth paste adding enough water. In the same kadai, heat oil and add in cinnamon, cloves, cardamom and black stone flower. Saute onion till transparent. Then add ginger garlic paste and saute till raw smell goes off. (Refer the above picture). Add chopped mushroom and saute for a minute. It will leave water. Add turmeric powder, red chilli powder, sambar powder and salt. Mix for a minute. Add the ground tomato paste and required water. Mix well and boil in low flame till oil floats on top. Gravy leaves a nice smell too. Switch off the flame. Garnish with coriander leaves. This kuzhambu thickens when it cools down. So add water to adjust the consistency. Check for salt too. 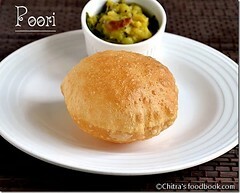 Mix with plain rice and enjoy with papad. 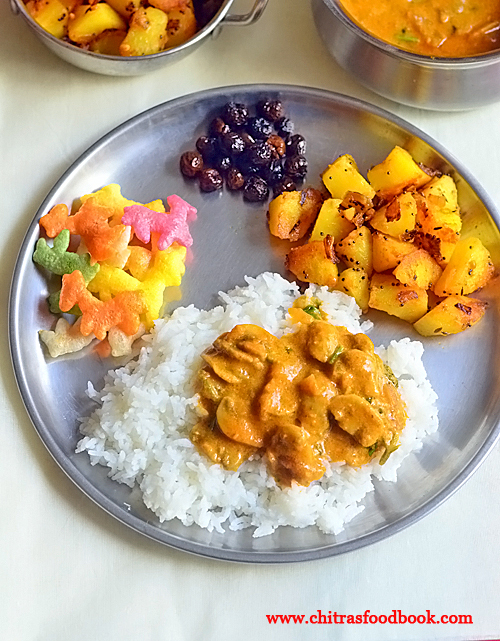 I served with potato curry. 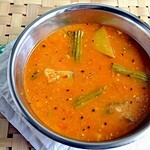 To serve as a side dish for idli, dosa dilute the gravy like sambar by adding some water. Boil and serve. 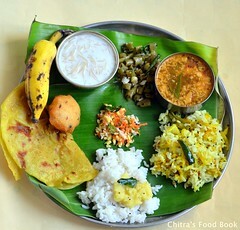 For chapathi, you can make it in kurma consistency. Enjoy ! For variations, you can add boiled and cubed potatoes along with mushroom. Adjust the quantity of chilli powder and sambar powder as per your taste. Do not add more tomato. If you add more, gravy tastes tangy. Mushroom itself has mild tanginess. So please be careful. 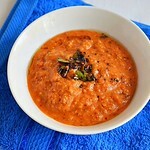 For variations, you can replace sambar powder with red chilli powder and dhania powder 1 tsp each. For best taste and flavor, this gravy should boil till oil floats on top. 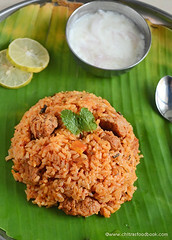 Try this easy, yummy mushroom kuzhambu for rice, roti, idli and dosa. You will love it ! Technorati Tags: Mushroom kuzhambu,mushroom kuzhambu recipe,kalan kuzhambu,kalan kulambu,mushroom recipes,Indian mushroom recipes,South Indian mushroom recipes,kalan recipes.